My love of just about all things palatable includes, of course, a wide and varied cuisine. I embrace just about every morsel grown, produced and/or cooked by indigenous peoples from all over this globe. I am particularly fond of locally grown or raised food. The term locavore has entered the lexicon in the past decade to define organized groups that encourage growing, producing and then providing local products to the restaurants, markets and people living nearby. This locavore movement also extends to beverages produced locally which include wineries, distilleries and craft breweries. And this is a movement with enough room for both vegans and carnivores! Supporting locally produced edibles has caught on just about everywhere in the US and is being embraced in communities around West Virginia too. Most counties and some towns in our state have established local farmers markets, and many restaurants are purchasing and then featuring these locally grown and produced foods on their menus. For a listing of a local farmers market near you, go to http://wvfarmers.org/. But there are several other organizations involved in the movement. I am board member of “The Collaborative for the 21st Century Appalachia” that has (thankfully) been co-named “WVFARM2U.” FARM2U actively promotes cultural and culinary tourism in large measure to connect the people involved such as farmers, restaurateurs, tourism promoters and the general public. As an example, one of our website pages (www.farm2u.org) has a listing of “destination dining” restaurants in West Virginia that use locally produced food. These establishments were nominated through a FARM2U survey of people who had exceptional dining experiences. A panel of culinary experts then selected the eventual destination dining restaurants. But you may recognize the FARM2U organization by one of the state’s signature culinary events – the annual Cast Iron Cook Off. The Cook Off is an event where everyone -from culinary students to chefs, to farmers, to local business people- participates in an Appalachian cooking competition focused on preparing local foods and using traditional cast iron cookware. Here are a few other organizations in the state that make it their goal to bring locally produced foods to your table. Check out the facebook page for the WV Food and Farm Coalition for information on Community Supported Agriculture Program (CSA) organizations. CSA’s put people who want to use local farm-grown products together with farmers that grow them. These farmers provide various locally produced foods for a subscription price. Two CSA’s were featured in a recent Sunday Gazette-Mail article by Dawn Nolan focusing on the good work being done by the Wild Ramp and Gritts Farm CSA’s. My family has participated in the Fish Hawk Acres CSA run by Chef Dale Hawkins. If you’re interested, check out Fish Hawk Acres’ facebook page for information on how to subscribe. We also receive regular local food shipments from the Monroe Farm Market (www.localfoodmarketplace.com/monroe/) This farmer coop, located in beautiful Monroe County, provides a variety of seasonal fruits and vegetables as well locally raised and butchered meat. We enjoyed a delicious leg of lamb from the Monroe Farm Market on Easter Sunday. As someone obsessed with food and wine, I understand the passion and commitment it takes to produce a product you wish to share with those in your local circle. We need to encourage our restaurants and markets to use our home-grown food – along with wine and other beverages (even beer) produced here in West By Golly. 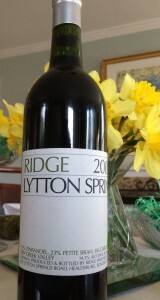 Here is a wine that will (and did) marry exquisitely with a Monroe County boned, butter flied and grilled leg of lamb. 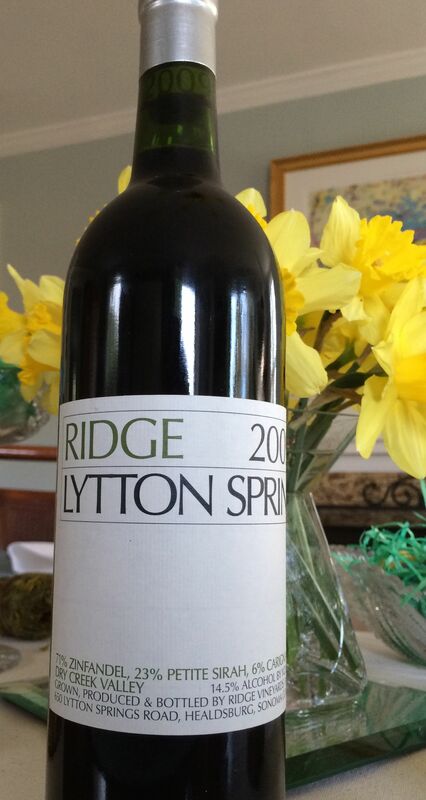 2009 Ridge Lytton Springs ($38) – This blend of 71 percent zinfandel (along with petite sirah, carignane and mataro) is the flagship product from my favorite zinfandel producer. With aromas of teaberry mint, this complex, layered, blackberry and cola flavored wine is full, rich and nicely balanced. It paired superbly with our marinated and grilled leg of lamb.